Cystic fibrosis is a hereditary disease that affects lungs and digestive system. Symptoms of the disease can differ from person to person. Amphotericin B is considered relevant treatment option for CF. Fig.1 Basic defect in the pulmonary epithelium at Cystic fibrosis. Fig 1-A(Normal). Chloride channel which is coded by CF gene controls the quantity and solute content of airway-lining fluid as well as inhibits the adjacent epithelial sodium channels. Fig 1-B (CF). CF gene defect causes absence or dysfunction of the chloride channel. This leads to reduced chloride secretion and loss of sodium channel inhibition with excessive sodium resorption as well as airway lining dehydration. Image adapted from . Statistics – It is estimated that more than 70.000 people worldwide are living with CF . U.S is known to be among countries with the highest incidence of CF, reporting around 1,000 new cases of CF each year (one in every 3500 births). More than 75 percent of them are diagnosed by age 2 . Incidence rates for CF in Canada and U.K tend to be very similar with those seen in the U.S, one in every 3000 births . On the other hand, CF is thought to be under-diagnosed in Asia and Africa, whereas in many countries there is lack of national registries .In the US and UK, average life expectancy is 35 to 40 years old. In countries such as El Salvador, India and Bulgaria, life expectancy drops below 15 .Data from cystic fibrosis foundation have shown that there has been decrease in the mortality rate over 30 years, and that the median age of a survival for a person with CF has increased from 11 years in 1987 to 19.3 in 2017 . Fig 2. Annual Mortality Rate Analysis (per 100 people with CF), 1986-2017. Image adapted from . Diagnosing and medications – Since CF is a genetic disease, carrier testing plays a key role in the diagnosis- it allows parents to find out about their chances of having a child with CF . Symptoms of CF usually start shortly after birth, many parents notice a salty taste when they kiss their child due to salty sweat, followed by other symptoms such as: persistent cough, poor growth, frequent lung infections, wheezing, bulky stools of difficulties in bowel movements etc . The sweat test is considered to be the golden standard for diagnosing the disease by measuring the chloride level in the person’s sweat . The test can be done on an individual of any age, but in order to deal with any health issue and seek the quick and best treatment the test is better to be done once the newborn reaches 10 days of age , . Treatment – Since there is no cure for cystic fibrosis, managing this disease is a challenge that requires a good cooperation between multidisciplinary team of doctors and medical professionals with patient and patient’s family. The medications that are used in the treatment in order to reduce complications and ease symptoms are: antibiotics to treat and control lung infections, anti-inflammatory drugs to lessen swelling in the airways, bronchodilators to relax bronchial muscles and oral pancreatic enzymes capsules to improve nutrients absorption by digestive tract . In addition, patients should do chest therapy in order to loosen the thick mucus, making it easier to cough . In order to have a better life, patients should be very educated about their disease; they should be very cautious on their diet, hygiene, medical appointments, and their environment . Latest research- The protein that is missing in the lining of the lung, shouldn’t be the reason for people to miss out on the opportunities that life has to offer them. The findings from the research done at the University of Illinois, Champaign which was supported by NIH’s National Heart, Lung, and Blood Institute (NHLBI) were published on March 13, 2019 showed that Amphotericin B(a widely-used antifungal drug) can replace the function of the defective CPR protein, making the battle against bacterial lung infections easier in the future . To study the effect of Amphotericin B, researchers used lung tissue from patients with cystic fibrosis and pig models of cystic fibrosis . After adding Amphotericin B in both experiments, they found that it can form ion channels that release HC03 – (bicarbonate) in lung tissues. The bicarbonate released from the channels brought the pH levels and liquid of airway surface within normal range, as well as increased antibacterial activity of the airway surface . Fig 3. Amphotericin B effect in lungs of people with CF. This figure shows that the treatment with the small molecule amphotericin B (AmB) which forms a non-selective ion channel, restores ion transport when CFTR is absent. 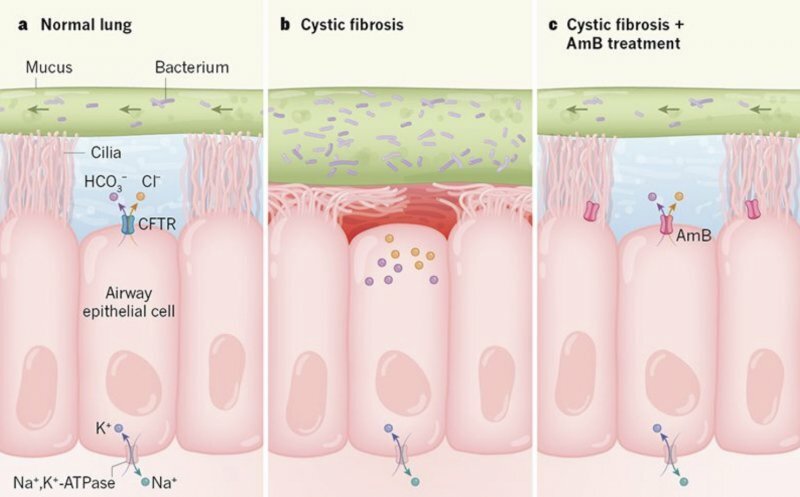 Since Amphotericin B is an approved drug which can replace the missing protein channel in the lungs by being delivered directly to them in order to avoid common side effects, it presents the potential therapy to reduce the burden of cystic fibrosis in the future. 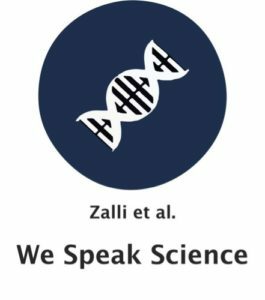 COPYRIGHT: This article is the property of We Speak Science, a non-profit institution co-founded by Dr. Detina Zalli and Dr. Argita Zalli. The article is written by Rexhep Sahatçiu, University of Prishtina, Kosovo. Davidson principles and practice of medicine 21st edition.